Jacob Philipp Hackert was the eldest of five brothers who all became artists and illustrators. Hackert first trained with his father, Philipp, then continued his studies at the Berlin Academy with Nicolas Le Sueur, before studying in the north of Germany and then in Sweden, where he is documented in 1764 in the company of Baron Van Olthoff. An itinerant painter, Hackert is recorded in Paris in 1765 with his brother Johann Gottlieb and in Italy in 1768, living in Rome. There he became part of the large German community whose illustrious members included Anton Rafael Mengs and Johann Joachim Winckelmann. He visited Naples in 1770 in order to execute a commission for Sir William Hamilton, returning there in 1782. In the latter year Ferdinand IV became interested in his work and commissioned a series of paintings that culminated in Hackert’s appointment in 1786 as court painter in Naples. He lived in that city until 1799 when it was occupied by the French troops under General Championnet, moving at that point to Livorno. 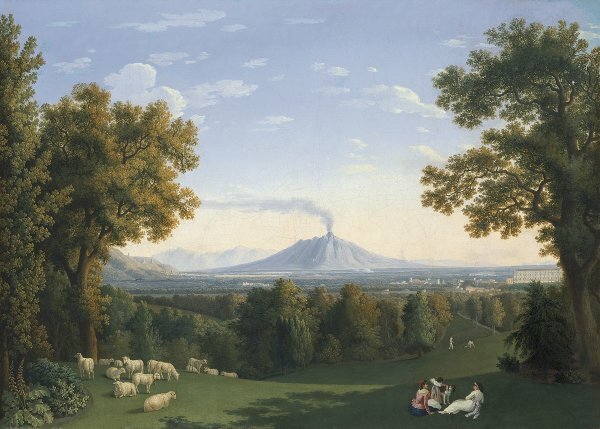 For the Neapolitan court Hackert produced landscapes, views of Naples and its surroundings with figures, and hunting, rural and military scenes. He became friends with Goethe who visited him in Naples on 14 March 1787, a meeting that the poet described in his travel diary. Using an elevated viewpoint, Hackert here depicts a panoramic view of the surroundings of the royal palace at Caserta, framed on either side by leafy trees that lead the eye into the centre of the composition with the massive blue cone of Vesuvius in the background. These three elements provide the setting for the vast plain on which we see the massive palace at Caserta in the middle-ground on the right, surrounded by green lawns and dense woodland. The foreground areas, in which patches of light and shade alternate, are used to house small groups of figures such as the one on the right in which two women with a small girl and a dog recline on the grass. We also see a brightly dressed couple in the middle distance on a gentle grassy slope. This peaceful, almost idyllic setting is visually balanced on the left foreground by a flock of sheep grazing on the grass among exquisitely neat flowerbeds such as the one at the lower left corner. Hackert painted the splendid gardens around the royal palace at Caserta on various occasions. The palace collection includes a canvas that dates from one year prior to this one and depicts the same view but with a slightly different angle of vision, with Vesuvius further to the right and without the palace. In that work the lawns of the garden are occupied by a group of three women and a small girl with a similar dog to the one seen here. The present canvas was acquired for the Collection in Munich in 1983.